Among the most popular literature of the 19th century, Louisa May Alcott’s work is timeless. Some of her classic books never have gone out of print, and much of her work only recently has been discovered. Alcott’s writing not only informs readers about the period in which she wrote, but it also reveals volumes about her life and family. Likewise, the covers that graced her books in the 19th and early 20th centuries offer an education regarding trends in book binding at the time. The PBO database currently has seventy-five editions of Alcott's books. More will be added. Although born in Pennsylvania (29 November 1832), Alcott spent most of her life in Boston and Concord, Massachusetts. Educated at home, Alcott and her sisters received from their parents a wealth of knowledge and a sense of moral responsibility. Amos Bronson Alcott was not only a teacher but also a philosopher and prominent Transcendentalist. The reform-minded Abigail May was involved in the abolitionist and suffrage movements. As a child, Alcott spent a great deal of time with her father’s friends, Ralph Waldo Emerson and Henry David Thoreau. Perhaps drawing inspiration from these notable figures, Alcott began writing when she was young. Her stories first found a public venue as plays that she and her sisters acted out for friends. She began publishing poetry and short stories in magazines in 1852, when “Sunlight” appeared in Peterson’s Magazine under the pseudonym Flora Fairfield. Her first book, a collection of stories called Flower Fables, was published in 1854. However, writing was not her only occupation. Because her family was poor, Alcott began working at the age of fifteen to help support her parents and sisters. She found any job that would hire a woman, working as a teacher, seamstress, governess, and household servant, among other things. Alcott’s real life fed her writing in many ways. In 1863, she published Hospital Sketches, based on the letters she had written home from Washington, D.C., where she served as a nurse during the Civil War. The book was not the only product of Alcott’s stay in the nation’s capital. She unfortunately contracted typhoid fever, and although she recovered from the illness, the mercury treatment doctors gave her would plague her for the rest of her life. Alcott’s childhood informed her most famous book, Little Women. Alcott was working as editor for the magazine Merry’s Museum when book publisher Thomas Niles asked her to write a story for girls. She drew inspiration for the main characters from her family, basing tomboy Jo on herself. Written in less than three months, the book was an instant success. She immediately penned a second volume, Good Wives, which was published in 1869. 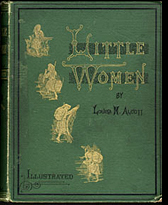 The two volumes thereafter have been published as one volume, known only as Little Women. The sequels Little Men and Jo’s Boys were equally popular. Although the Little Women series and many of Alcott’s other works were essentially written for children, Alcott had another side. She penned a number of sensational, adult-oriented stories anonymously and under the pen names A. M. Barnard, Aunt Weedy, Flora Fairfield, Oranthy Bluggage, and Minerva Moody. The Gothic thrillers she authored as Barnard were particularly lucrative. The financial success of Alcott’s books yanked her family from poverty, but her home life still was fraught with tragedy. Her sister Elizabeth died of scarlet fever prior to the publishing of Little Women, a blow from which Alcott’s mother never recovered. In 1877, Abigail May died as well. Two years later, Alcott’s youngest sister, May, died from complications after childbirth. May lived long enough to name her daughter Louisa May, and she asked Alcott to raise her namesake. Alcott took care of young Lulu for eight years, while her own health rapidly declined from the mercury poisoning. She fell into a coma while caring for her ailing father, who died in March of 1888. Alcott followed two days later. She was buried across the feet of her parents and sister Elizabeth. Alcott remained busy during the twenty years between the publication of Little Women and her death at the age of fifty-six. Following in her mother’s footsteps, she took up the cause of suffrage, writing for The Woman’s Journal and canvassing to encourage women to register to vote after Massachusetts granted women suffrage for school, tax, and bond issues. Alcott became the first woman in Concord to register, voting in the village’s school committee election in 1879. The Alcott legacy lives on in her writing, as well as in the films that have been made of her books. Although more than thirty volumes appeared during her lifetime, she was more prolific than most of her contemporaries ever knew. Much of her work has been found in her papers and published in the century since her death. NOTE: Only books Louisa May Alcott published under her own name are listed. Most of the stories written anonymously and under pseudonyms were republished in collections that are listed under her posthumous work below. The following volumes consist of work previously published in periodicals or under pseudonyms, as well as previously unpublished work discovered in the Alcott papers. Children's books by Louisa May Alcott, K-5 lesson plan: Word document or PDF file. Louisa May Alcott's Little Women, 6-8 lesson plan: Word document or PDF file. Louisa May Alcott's hidden thrillers, 9-12 lesson plan: Word document or PDF file. Delamar, Gloria T. Louisa May Alcott and "Little women": Biography, Critique, Publications, Poems, Songs, and Contemporary Relevance. Jefferson, N.C. : McFarland, 1990. Elbert, Sarah. Hunger for Home: Louisa May Alcott's Place in American Culture. New Brunswick, N.J.: Rutgers University Press, 1987. Johnston, Norma. Louisa May: The World and Works of Louisa May Alcott. New York : Four Winds Press, 1991. Keyser, Elizabeth Lennox. Whispers in the dark: The Fiction of Louisa May Alcott. Knoxville: University of Tennessee Press, 1993. Matteson, John. Eden’s Outcasts: The Story of Louisa May Alcott and Her Father, W.W. Norton, 2007. Meigs, Cornelia. Invicible Louisa: The Story of the Author of Little Women. Boston: Little, Brown, 1968. Saxton, Martha. Louisa May: A Modern Biography of Louisa May Alcott. Boston: Houghton Mifflin, 1977. Stern, Madeleine B. Louisa May Alcott: From Blood & Thunder to Hearth & Home. Boston: Northeastern University Press, 1998. Strickland, Charles. Victorian domesticity: Families in the Life and Art of Louisa May Alcott. Tuscaloosa: University of Alabama Press, 1985.